To ask Jasinda Wilder questions, please sign up. Will there be a Stripped sequel? Jasinda Wilder Yes. Trashed will be out in November! Will there be a third book of Alpha? THE FIRST BOOK IN OUR NEW FIFTY STATES OF LOVE SERIES RELEASES EVERYWHERE TODAY! When you’re from a place like Clayton, PA, you either leave as soon as you can, or you never leave. We can’t even say we’re a one-stoplight town, because we don’t have a stoplight, just a traffic circle on a minor local highway. Here in Clayton, everyone knows everyone, and gossip and rumors are a way of life. "This was so good. I am really looking forward to the next 49 books! Loved Elise, Cora, Aiden, Jamie and grandma and papa. Great story line, characters and situations." This was sooo awesome! I loved their journey. They both had so much pain from their marriages. And he was so sure. Jasinda Wilder is a terrific author that weaves an amazing story!" 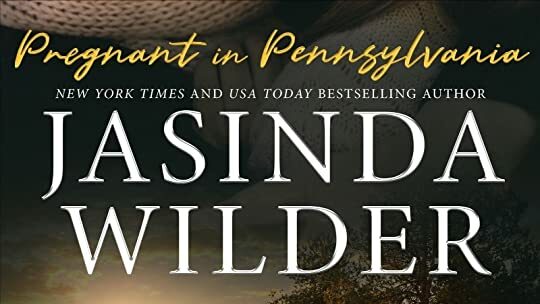 "I have missed reading Jasinda Wilders books, not sure why I stopped. Loved reading Pregnant in Pennsylvania. Love the people in this book, Elyse, Aiden, Cora and Jamie. Life could only get better for these people. Jasinda Wilder made a comment on The wait is over! BADD MOJO IS HERE!
" I've contacted Amazon and I hope they have it up soon. Sorry for the delay! " " Thank you so much for reading. ❤ Thank you so much for reading. ❤️ ...more "
Jasinda Wilder made a comment on YOURS sale and giveaway! Jasinda Wilder made a comment on Step through into THE BLACK ROOM.
" Thank you! ❤ Thank you! ❤️ ...more "
What do you want to be our contemporary group read for October? Thanks Jasinda for accepting my friend request! I ♥love♥ your books keep up the good work! Jasinda ! Thank you for accepting my friend request !! I just had to let you know I am such a fan, your books leave such an imprint. I love your music connections - which leads me to my comment - have you heard A great big worlds 'I dont wannna love somebody else' ? I cant listen to it without thinking about Ben... God POOR BEN!! My heart aches for him... Please tell me he gets a book & a happy ending?!! Thanks for adding me. I love your profile pic! I just read ur book Wounded. It has an amazing story. I especially Luved d time period of d story. When I 1st started reading it I started crying for d pain I felt thru Raina. I would just say one thing, pls never stop writing books like these. I gotta say, I've read over 100 NA romance novels since December 2012 and you, Jasinda are in my top 3 favorite authors. You write well, you write steamy, and you write a good story....period, despite everything else. I can forgive some so-so writing if the story is really good. But YOU..... are not So-So, you "is Somethin' Somethin'!" I've read "Falling" series, Wounded, and Preacher's Son (damn that was hot) and will read Stripped soon. I wasn't initially interested in the other serials (biker, delilah, big girls) simply b/c of the cover art (I know stupid reason), but your style is right up my alley, that I will give it a go. Just had to let you know that I feel like I can count on a good story from you. ughh all the Stripped reviews on my goodreads TL are making me want to read this book >< 3 more days!!!! yes, i'm counting!! I was wondering if you plan on doing a book tour on west coast? And thankfully you put a sneak pick of Stripper at the end. I’m so excited about this one…the teaser you provided was amazing can’t wait till August! Any update you want to share with us..?? Thank you SO MUCH for writing such an emotional and incredible series with Falling. Man, both books were amazing, and I'm so happy with the ending in the second book! Are you planning on writing any more books in the series or is that it? Hey Jasinda, thanks for accepting the friend request. I am one of your many fans in Australia and I was so absolutely thrilled and excited when I saw you on the morning show here this past weekend!!! I may or may not have been yelling at the TV that I have read your books and love them! Great interview and look forward to reading the rest of your stuff! Oh and keep in mind that we would love to have you visit us down here! Hi Jasinda. Read some great reviews of your books so I'm now waiting for my Amazon delivery, as I can't find your Big Girls series here in UK bookstores, can't wait!! Hi Jasinda! Thank you for being my friend. I was wondering do you need to read the Rock Star Do It series before reading Big Girls Do It Pregnant? I just wanna make sure I don't miss anything before reading it. Jasinda wrote: "I didn't write this one with any plans for a sequel as it felt pretty complete to me. I know the readers really want it to continue so I will be trying to make that happen for ya. Thank you so much..."
Thanks for the add Ms. Wilder, looking forward to reading your book(s) :). I want to have a copy of Falling into You!!! So I get bored at my new job since I'm in fornt of a computer all day and all i do is look on amazon for new books and I stumbled upon your Big Girls Do It series and I have to say I love it! I alays knew Anna would choose Jeff, he's such a sweetie. Now I can't wait for Big Girls Do It Pregnant. I'm so carried with your books! Thanks for friending me, I absolutely love your books. Realitycheck wrote: "Thanks for the friending, please feel free to check out my bookshelves, quotes, friends and groups for things that might interest you or you read and forgot about." Kimberly wrote: "Thanks for being my friend. I cant wait to read more of your books. I hope the series i have read have more coming... cant wait." Thank you for reading Kimberly. So glad to hear you have enjoyed my books. Thanks for being my friend. I cant wait to read more of your books. I hope the series i have read have more coming... cant wait.